This is one of my own recipes for Healthier Egg Free Rhubarb and Ginger Muffins, instead of Egg I used Banana; I also substituted Milk with Almond Milk and swapped Butter for Fat Free Greek Yoghurt. I used paper muffin cases but I would recommend using lightly oiled silicone cases, as the muffins do not have butter they tend to stick to the paper cases. The filling is a Rhubarb and Ginger Conserve by The Mercers. 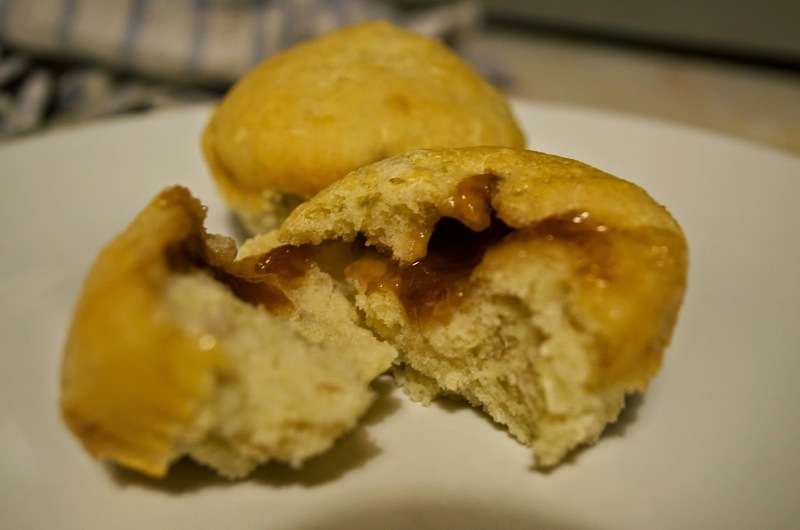 The muffins are a basic muffin recipe so feel free to get creative with the fillings. 1. Preheat the oven to 190C/375F/Gas 5. Stand 12 paper or silicone muffin cases in a muffin tin, or simply grease the tin thoroughly. Sift the flour and baking powder into a mixing bowl and stir in the caster sugar. 2. Mash the banana in a separate bowl or jug and beat in the almond milk, fat free greek yoghurt and vanilla extract. Add to the flour mixture and fold together lightly. The mixture shouldn't be over worked, just fold enough until all the flour has been combined. 3. Separate half the mixture into the muffin cases and save half in the bowl. Top each one with half a teaspoon of the conserve filling, then cover with the remaining muffin mixture. 4. Bake for 15-20 minutes, or until the muffins are well risen and golden. 5. Remove the hot muffins from the tin and leave to cool on a wire rack.